Pick up and deliveries will be from the 17th - 24th Dec.
BOSS MEATS is a small cottage producer who are also gourmet butchers with a processing facility on their property at Stanthorpe. Greg from BOSS MEATS has been involved with the Organics industry since the early 80's and has been an organic farmer. ALL animals are either rasided on the property, or souced locally from farmers who are raising both certified organic and true free range holistically farmed animals. Rinse Ham Bag in a solution of water and one tablespoon of vinegar and squeeze out the excess. Wipe ham clean with a damp cloth. Place ham in the ham bag and refrigerate. Rinse out your Ham Bag every 3 days to retain freshness. Keep your ham bag moist. Bendele TURKEY WHOLE Free Range Ethical, free range - 3.5 - 6 kg - White turkey (most familiar) *** FRESH or FROZEN *** ORDER NOW FOR XMAS PIC UP OR DELIVERY 19-23 DEC *** If you need earlier please call or email to arrange. Green Ag TURKEY WHOLE Organic 100% certified organic free range - 3.5 - 4.25kg ($30.30 per kg) *** FRESH or FROZEN *** ORDER NOW FOR XMAS DELIVERY 19-23 DEC *** PRE-ORDER / PAYMENT REQUIRED *** If you need earlier please call or email to arrange. 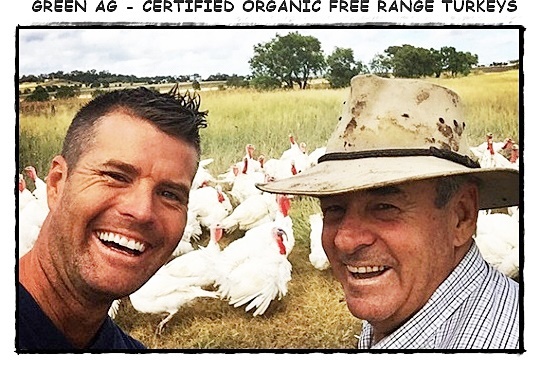 Green Ag TURKEY WHOLE Organic 100% certified organic free range - 4.5 - 10+ kg ($28.00 per kg) *** FRESH or FROZEN *** ORDER NOW FOR XMAS DELIVERY 19-23 DEC *** PRE-ORDER / PAYMENT REQUIRED *** If you need earlier please call or email to arrange.